• Did you always want to be a jewelry designer? How did you start your career? I began making jewelry as gifts for friends and relatives white attending the Fashion Institute of Technology in New York for Fashion Design. The gifts were so well received that I made a small collection to sell at craft shows and street fairs and, at one of these shows, a large costume jewelry company approached me to design for them; I took this as a sign, and decided to change my major at FIT to Jewelry Design. After graduation, I traveled around Europe for the summer and fell in love with Paris! I ended up living there for 3 years, designing couturier jewelry collections for Courreges, Cacharel, Carita, and Guy Larouche. • At what point did you decide to create your own brand? As much as I enjoyed the challenge of creating for renowned designers, I needed to forge my own artistic path. I began creating pieces on the side for myself, and decided to enter the 2006 JCK Rising Star competition (which came with a booth at the JCK trade show in Las Vegas.) I won the competition, which labeled me a “Rising Star” in the jewelry industry, and Pamela Froman Fine Jewelry was officially born. • What makes your jewelry different from other brands? How did you develop your signature style? I think that my special 18k gold colors, and the way I mix the colors together in one piece, is what really distinguishes my brand. I spent a lot of time working with a metallurgist to develop these custom alloys, before launching my line. I also experimented with various tools to achieve the irregular texture I call "Crushed", and I had to create my own special finishing-wheel to get the right combination of not-too-matte-not-too-shiny finish that I wanted to achieve for my collection. All of this, combined with amazing unique gemstones, makes my jewelry stand out. • How would you describe the style of your jewelry? Versatile, Understated Glamour: I design with wearability in mind. I want my pieces to be worn, not locked away in a safe, and I believe my “Crushed” texture and satin finish paired with high quality diamonds, lends an understated glamour to the pieces that make them incredibly wearable; they can just as easily accessorize a pair of jeans as they can an evening gown. • Do you do individual orders? Have you ever had any unusual ones? I have done a few… usually it’s a custom engagement ring, but the oddest request I ever received was from someone who wanted me to plate their extracted wisdom tooth in my signature 18k green gold, and turn it into a necklace for their boyfriend! • Do you think trends in jewelry are as important as trends in fashion? There are definitely times when a piece of jewelry becomes more popular because of current fashion trends, such as the color of the gemstone being similar to Pantone's "Color of the Year", or maybe the style of the piece is reminiscent of an era being represented on the runways. But, I do think trends are less important in fine jewelry, maybe because gold and gemstones are longer-lasting than cloth and leather; I design my pieces to be timeless, not trendy, so they can be collected, passed down, and appreciated for generations. • Which materials and stones do you like to work with? I work primarily in 18k gold, and I feel that’s what I’m most known for. I also use 22k and Platinum from time to time, and I have just started working in Palladium. I love irregular surfaces, which is why most of my Collection is textured with a special technique I call “Crushed” (I use too many tools to simply call it hammered.) Combined with a Satin finish, this Crushed texture gives a much softer, more organic feel to the metal. When it comes to gemstones, I believe “semi-precious” is a misnomer; all natural gemstones are precious to me. I especially love stones with irregularities that make them unique works of art, like labradorite, rainbow moonstone, opal, and tourmaline. I also love working with “rough” or “rustic” diamonds for the same reason: they’re so unique! However, the colorless diamonds I use are held to a higher standard: they are all brilliant-cut, F-G color, VS quality or better, so even the smallest diamonds have fabulous sparkle! • Which pieces are your bestsellers? My "Crushed Headlight" Hoops (in all sizes), "Cleopatra Sparkle" Ring, and multi-color "Get A Crush" Stackable Rings continue to be my best sellers, and I feel these are staples of my collection. Also, my one-of-a-kind and limited edition "Scroll Crush Cap" earrings have been very popular these last few years, especially in Green Onyx and Rainbow Moonstone, as well as my one-of-a-kind cocktail rings! • Where do you get inspiration for your pieces? I am inspired by Old-world European architecture, especially scrolly wrought iron gates, and the beautiful domes of St. Petersburg. I also find inspiration in fabrics and textures, and often the gemstones I choose influence the design. • Your mother is a sculptor so being surrounded by art your whole life must have been an influence on you. In what ways? • Do you believe that jewelry can bring good or bad luck? I don’t know if it's necessarily luck, but if a person is drawn to a piece of jewelry strongly enough to buy it, then I believe that good feeling will stay with them while they wear it. • Do you have any favorite pieces of jewelry that you wear all the time? Do you generally wear a lot of jewelry? On a daily basis, I wear 4 pieces of jewelry: My 2" 18k Yellow & Pink "Ombre Headlight Hoop" Earrings; the matching "Ombre Cleopatra Sparkle" Ring; and my 18k Yellow "Eternal Scroll Sparkle" Ring, which I wear on my thumb; the 4th piece changes, usually it's a fabulous new one-of-a-kind ring or cuff that I want to enjoy before it sells, sometimes a necklace. • How would you describe your personal style? I dress in Black a lot and would say my style is "cool chic", but my jewelry definitely brings the outfit together. • What kind of women wear your jewelry? The women who wear my jewelry are confident, with a strong sense of their own personal style, regardless of age. They each want to be seen as a unique individual, and their choice of jewelry reflects that desire. In short: If everyone’s wearing it, they're not interested. • Who are your celebrity clients? Does having a strong celebrity following help you a lot in your work? Halle Berry, Pamela Anderson, Diane Lane, Debra Messing, Whoopi Goldberg, Norah Jones, and Eva Mendes, are a few who have worn or purchased my work. I'll admit, it's thrilling to see images online of Halle wearing my hoops all over Los Angeles, but I don't know whether or not that's increased sales of my work to the general public. I'd like to think my customer's individual sense of style doesn't need to be validated by celebrity endorsement. • In which parts of the word is your jewelry sold? And in which countries is it most popular? My jewelry is sold all over the United States, parts of Canada, France and Russia. My most fabulous pieces (glamourous earrings, cocktail rings and statement necklaces) have been more popular in Russia, while the more casual day-to-night pieces are the best-sellers in the U.S.
• What are your plans for the future in terms of the collections and expansion of your brand? For the collection, I have been expanding my popular "Ombre" color-way (a subtle combination of 18k Pink & Yellow), as well as adding more expensive gemstones, like Tanzanite and amazing specimens of Australian Opal. 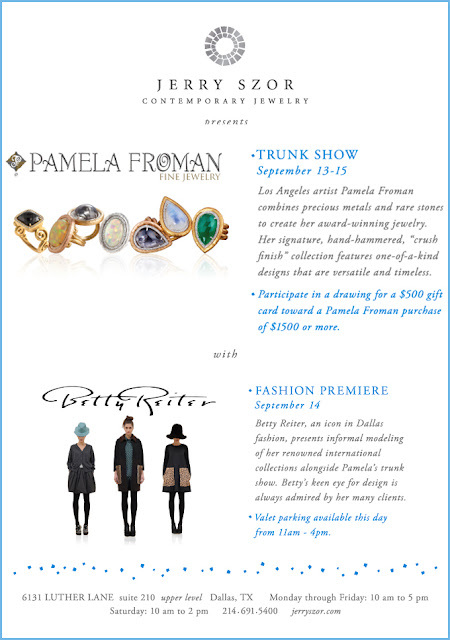 As for my brand, it has always been my plan to expand into a complete lifestyle brand: Pamela Froman Luxury, which will include designer home goods like light fixtures, handles for drawers and cabinets, perhaps handbags and belts, and I've always dreamed of collaborating with a watchmaker… so keep an eye out for Pamela Froman Luxury in the coming years! Labels: aeroflot russian magazine. aeroflot airlines. Jetaime. If you are in Dallas come visit us September 13th-15th at Jerry Szor, a beautiful contemporary jewelry store and see our latest creations, and on September 14th we have a special treat; together with Betty Reiter's international renowned collection we will adorn her models for an informal fashion show. 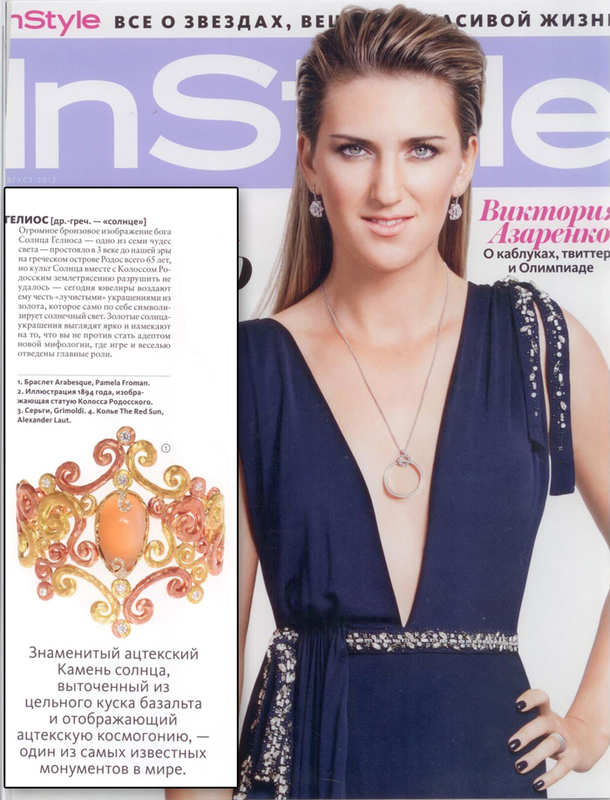 Pamela Froman's gorgeous "Ombre Arabesque" Cuff (18k Pink & Yellow "Crushed" Gold with Diamonds and a Peach Moonstone cabochon center) was recently featured in Russian InStyle Magazine! Available at Je'Taime in Russia, this fabulous cuff can be ordered through our American retailers as well.